Bhubaneswar, July 31 (IANS) Odisha has received an average rainfall of 340.1 mm against the long term average of 339.9 mm in the month of July this year, an official statement said on Monday. 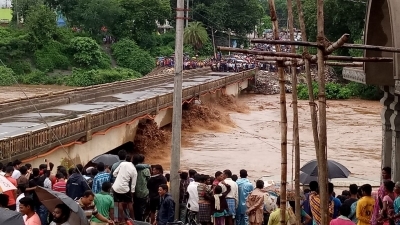 Kalahandi district received the highest rainfall of 510.6 mm during the month whereas Nuapada district received the lowest rainfall of 170.9 mm, said a release from Special Relief Commissioner’s office. The cumulative rainfall of the state in June and July remained 548.5 mm against the LTA of 556.4 mm registering a marginal shortfall of 1.4 per cent. As many as five districts namely Ganjam, Rayagada, Kalahandi, Gajapati and Nawarangpur received surplus rainfall of more than 19 per cent. DFistricts which received normal rainfall are Sundargarh, Malkangiri, Khordha, Jharsuguda, Koraput, Deogarh, Jagatsinghpur, Sambalpur, Puri, Cuttack, Subarnapur, Boudh, Kendrapara, Mayurbhanj, Nayagarh, Balasore, Bhadrak, Bargarh, Keonjhar and Kandhamal. Rainfall in four districts namely Bolangir, Nuapada, Angul and Jajpur remained between 19 and 39 per cent deficient during the period from June 1 to July 31, said the release. Dhenkanal is the only district where rainfall remained severely deficient, to the extent of a 40.8 per cent shortfall. On an average, the state experiences 15.4 rainy days in the month of July. There were 15.6 rainy days during July this year. In June 2017, there were 10 rainy days against the normal average of 9.9.days.